OIKE & Co., Ltd. was founded in 1876 as a manufacturer and seller of gold and silver thread for use in traditional embroidery. Over the succeeding years we have become a leading producer of decorative materials for kimono and handicrafts-including metallic yarns and powders-and of packaging materials for keeping food fresh, such as film processed using vapor deposition. We are pioneers in the use of dry and wet coating technologies in manufacturing. The success of the OIKE Group is founded on a range of quality products that respond to the needs of a changing society. 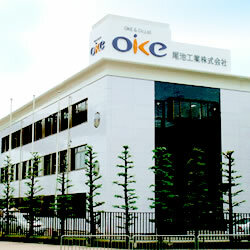 OIKE is a company with deep roots in the region and society of Kyoto. Accordingly, to advance in the years ahead we must welcome change and the possibilities it brings. With that in mind, the entire company is now working as a team to implement reform and bring a new OIKE into being. A key aspect of reform is the shift in focus away from core fields of the past. For example, we have responded to recent growth in the electronics business, particularly in regard to products such as digital cameras and mobile phones. We are now producing materials for the reflective film of plasma displays and LCD panels, and for touch panels and similar components. Today we are helping to bring forth a true information society by supplying such materials for products in the fields of electronics and information technology. Companies in virtually every field are striving to create products with high added value. OIKE is responding to that need with transfer film products that bring new functionality to existing materials. As a result we're able to help firms in the manufacturing and construction industries supply products with enhanced quality and functionality. The potential of the new OIKE lies in this and other fields that had previously gone unexplored. Even though we are striking out into new fields, we're careful not to diversify indiscriminately. The two examples mentioned above have come about through the expansion and redirection of proprietary technologies. Our core competence encompasses dry and wet coating technologies. Used creatively, such a competence offers considerable potential for new opportunities. For example, it is conceivable that the addition of silver, with its bacteria-resistant properties, to other materials might have useful applications in the medical field. The new "OIKE" is enthusiastically exploring such possibilities by strengthening our development sections: the "Frontier Center" and "Kurayoshi Development Center".